Here's a question to ponder. Why would an artist do a solo album and not use his or her name to identify it, but instead use a project name? 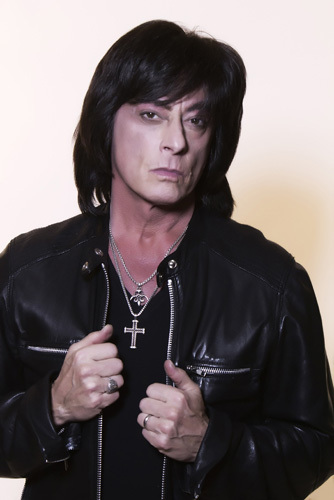 Such is the case with the Sunstorm which, essentially, has always been a platform for veteran journeyman vocalist Joe Lynn Turner, of Rainbow, Deep Purple, and Malmsteen fame and recently Rated X. 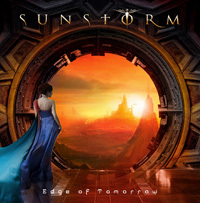 He arrives with his fourth Sunstorm, Edge Of Tomorrow with songs written by the ubiquitous musician and producer for Frontiers, Alessandro Del Vecchio (Hardline, Edge of Forever). There's little to explain about this Turner offering. It's straight up melodic hard rock with a metal edge in an AOR wrapper, with Turner's voice leading the way. He's in fine form on this platter: strong, forceful, and commanding, yet still melodic and passionate. To which, I'll requote and paraphrase myself from my recent review of the latest Ted Poley album: "And that's the positive thing about this album: you hear Turner on every song unlike the recent Chris Ousey album, where Ousey sounded like the proverbial third wheel. Turner has a natural instinct for a song's melody and always stays with it. Also, he's never straining, nor putting himself out of range." Basically, the album is everything you like about JLT and his interpretation of melodic hard rock. As for the songs, from the gate they rock, again, that straight forward metal-edged melodic hard rock. Some songs are ripping and roaring like the speedy You Hold Me Down, the powerful barrage of riffage at the start. Another can start the same way, strong riffs only to fool you, rather leading to something slightly softer in the AOR range. But that real AOR character shines better in Don't Walk Away From A Goodbye and even more so within The Sound Of Goodbye, mostly from the the melody which rises high in the catchy chorus. Not dismissing the entire album by any means, but I preferred the style and sound of these two songs above anything else here. While the album mostly rocks, there are no "true" ballads either. Instead, songs such as The Darkness Of This Dawn and Burning Fire simply dial things back ever so slightly, mostly in the pacing, for steady metal anthems. Throughout, besides Turner's power voice, there's an abundance of terrific riffs and blistering guitar solos. Also with Del Vecchio at the knobs, the production is stellar. Press material suggested that Turner wished a return to more AOR-like songs, yet spiced with the harder edge of his Rated X gig. He pretty much nailed it. If you're a Joe Lynn Turner fan, you'll dig this album. But I can't believe the dude is nearly 65 years old. Wow. What lungs. Recommended. Press material suggested that Turner wished a return to more AOR-like songs, yet spiced with the harder edge of his Rated X gig. He pretty much nailed it. If you're a Joe Lynn Turner fan, you'll dig this album. Recommended.